There is something very post modern about this review. I was offered a copy of this new book (out 3 January 2017) to review, but what I got was an ebook hobbled by Digital Rights Management. It expires in a month and I am not allowed to cut and paste any quotations from it. Now I may not know much about copyright but I do understand the concept of “fair use”: which includes quotation! 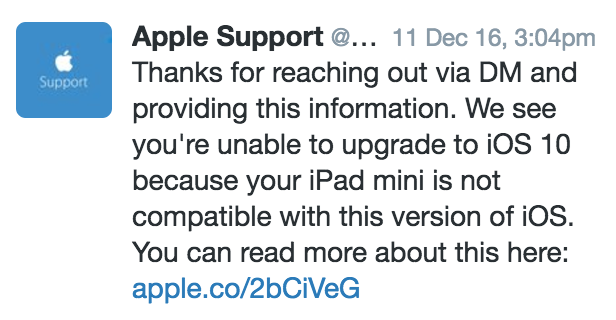 The iPad mini in question is less than two years old. I have determined by reference to the book that I am not alone in this experience, and indeed it appears to be a long established policy of Apple. Indeed within the product cycle, the life of the hardware is prescribed – and there will inevitably come a day, long before the device in question is beyond repair, when its operating system will not get updated any more. There is a case in the book of the iPod whose battery life was designed to be 18 months, and the battery could not be replaced by the user. There is also a documented legal case of an iPod mini designed and sold as an adjunct to exercise which failed when it came into contact with human sweat. Apple’s advertising showed the device attached to human bodies under exertion! There is nothing new about planned obsolescence. I read Vance Packard’s The Wastemakers at East Ham Grammar School when I studied A Level Economics (1964-66). Everybody knows about GM’s policy of annual model changes based simply on design as opposed to technical innovation. And the cartel of lightbulb makers who made their products fail earlier so that they could sell more of them. My Dad told me about British carmaker Armstrong Siddeley that went bust because their cars were built to last – and no-one ever bought another one having no need since the first one they got was so well made and reliable. I fully expect my 2007 Toyota Yaris to see me out – unless there is a sea change at the strata council and I could install a charger for an electric car. Or Modo relents and puts a shared car in our neighbourhood. If you are a student then you will be comfortable reading this book. It is remarkably short – I read it cover to cover in two hours or so – and is well annotated and referenced. It does acknowledge Brexit – which will probably remove British consumers from all the EU protection offered to consumers, which is remarkably advanced compared to North America. But was obviously written pre Trump. With leaders like Trudeau and Clark we cannot expect anything other than continuing adherence to the best interests of their funders. And just as the fossil fuel industries will ignore the carbon bubble for as long as possible, we can confidently expect the 0.01% and the corporations they control to continue to ignore both the pile up of garbage and pollution and the growing shortage of critical raw materials (like rare earths) as long as their profits increase and remain largely untaxed. So acquiring this book if you are an activist and wishing to bring about some change is likely to disappointing. But if you are really in need of an education in the theory of planned obsolescence this might be worth forty quid to you (CAN$66.45 at the time of writing). But as far as prescriptions go, there’s not much. The certainty that the “current hegemonic paradigm will not allow humans to remain on this planet much longer” – and therefore the need to “walk in search of new patterns, new models, new meanings to then build new paths, new paradigms”. Planned obsolescence is when a product is deliberately designed to have a specific life span. This results in the overexploitation of natural resources, increased waste, with huge social impacts. It is very well known in industries such as consumer electronics, but it is now creeping into other sectors. This ground-breaking new book looks at the cost and consequences of planned obsolescence and its negative effects. It considers the sustainability, legal and economic theories behind it, how to mitigate these manufacturing strategies and find new ways of working. Understanding Planned Obsolescence includes a wide range of case studies from Europe, the USA and South America. Will the new range of Apple products contribute to waste? The short answer is yes, because continuous updates to the operating system render older iterations of the product obsolete, which drive consumers to purchase new products and throw the old versions to the side. The long answer details what happens to those discarded products, which cost time and money to produce: they are now obsolete, driving consumers to lust after the newest version to meet their needs and keep up with the culture of ‘use a year and throw away’ that manufacturers like Apple have created. Planned obsolescence, the practice of intentionally creating products with short lifespans, can be witnessed in products ranging from cars to jeans, and the consequences for the practice vary equally in scope. Reasons for the practice’s existence can be traced back to customers just as easily as to companies, but a debate on who takes responsibility needs to be informed so that both sides can understand the phenomenon and take educated steps to mitigating it. 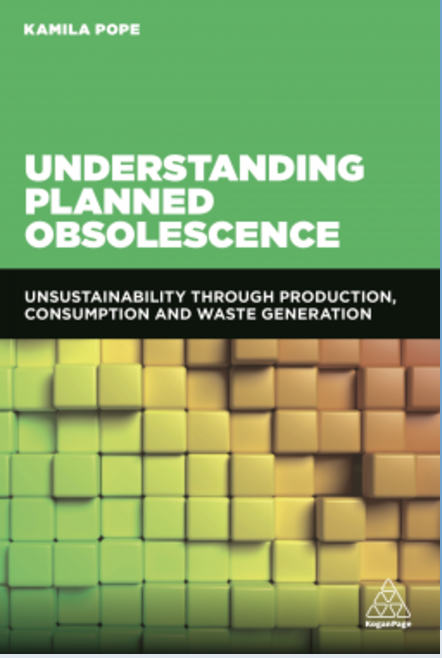 Understanding Planned Obsolescence: Unsustainability through Production, Consumption and Waste Generation, out 3 January, aims to inform this debate, providing the basics into the practice. This ground-breaking new book looks at the causes, cost and impact of planned obsolescence. It considers the legal and economic frameworks to overcome the practice and how to mitigate its effects. This book is essential for sustainability students and practitioners who seek to understand planned obsolescence and the consumers’ role in the practice. Thierry Libaert, initiator and main rapporteur on the European Economic and Social Committee opinion on planned obsolescence, provided advanced praise for the book, calling it ‘an absolute reference on planned obsolescence; it overcomes strictly technical or environmental visions to replace them, giving meaning and understanding in a broader economic and political context. The author does not merely describe a phenomenon, but presents a range of possible solutions’. About the author: Kamila Pope is an Environmental Law and Bio-law lecturer, researcher and lawyer in Brazil. She has published a plethora of articles, chapters and papers covering Environmental Law, Sustainability, Planned Obsolescence and Waste Management. She holds a Master’s in Law, Environment and Political Ecology and is working toward a PhD in Law, Politics and Society. 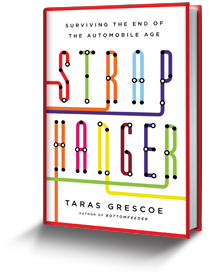 I was pleased to get an invitation to read a review copy of Straphanger by Taras Grescoe. I was even more pleased when I got it straightaway as a download. The download I get, of course, has a limited life – but longer than the average library loan. On the other hand it does not permit me to copy and paste excerpts into a review. This is annoying because that is actually covered by the “fair use” exception in copyright law – but apparently Adobe Digital Editions do not allow for that. Not surprising really given the foofooraw over DRM in general. On the other hand the book has already been reviewed in the mainstream media (here for example is the Globe and Mail’s take on it). More importantly big chunks of it – far more than would ever get into any review – are currently getting on line in Spacing magazine’s various web presences. This does enable one to cut and paste – but much more importantly it means you can read big chunks of it too. You do subscribe to Spacing Vancouver don’t you? For example today’s extract is all about Copenhagen. The Canada Line, completed for the 2010 Winter Olympics, whisks passengers in Korean made electric trains at 50 miles an hour toward the West End. As the driverless light-rail train crosses the Fraser River, I marvel at how thickets of office and condo towers, each cluster corresponding to a SkyTrain station, have cropped up at intervals of about a mile and a half, where once there was only low-rise suburbia. No you didn’t. What you see as you leave the airport and before you plunge into the tunnel after Marine Drive station looks nothing like that. I mean, yes Taras, you might marvel at that from the distance of your Montreal home based on what you have been told, read and even seen on some visits. But not only does it not look like that as you cross the Fraser River, much of Vancouver does not look like that. There are no “thickets of office towers” apart from around Burrard Station – and the twin towers of Metrotown where Translink is currently located (where there were supposed to be more, but they have not been built). And you will certainly not see anything like that along the Canada Line except the condos at Lansdowne and Brighouse. There’s also a few high rise buildings near Bridgeport but those are hotels and they are there because of the airport and proximity to the freeway exit. Now there will be a massive high rise at Marine Drive – but it isn’t there now to marvel at. What most of us notice is the lack of development at Broadway and Commercial – where two SkyTrain lines meet and Safeway’s car park is the most noticeable feature – one that Brent Toderian points out to visitors as an example. Nothing happened at 29th Avenue or Nanaimo either. Joyce/Collingwood is the Vancouver exception. Burnaby and New Westminster did get Skytrain stations, and have also concentrated development at one or two stations. (There is a long piece in the Straight on New Westminster’s transit oriented development.) Burnaby continued with dispersed office parks and low density commercial sprawl both unrelated to transit. Surrey is now making the best of the Surrey City Centre – but for much of the intervening period (between the Scott Road extension opening and a couple of years ago) also pursued sprawl at highway intersections. In that case actually with the enthusiastic support of the province, which used highway land sales to developers to help pay for intersection “improvements”. What Translink’s recent release of its frequent transit map shows is that most of Metro Vancouver is just like most of the rest of North America. Yes we may be doing a bit better than Portland (the chapter in the book is a head to head comparison) but that is not saying much. That is just not true. Highway #1 is a freeway, and it runs through the City of Vancouver’s North East Corner. From the Second Narrows Bridge to Boundary Road, through the Cassiar Connector tunnel, that is City of Vancouver. And the freeway expansion is going to dump lots of traffic into Vancouver’s east side. Eh? What federal highway money? There was a small one off federal contribution to the original Skytrain. A grovelling provincial government even stuck Canada word marks on the trains as part of its campaign to get more federal contribution to the Canada Line – so named to attract the same funds. But Canada does not have a federal transit program – and its highway money comes as specific grants for favoured projects in critical ridings too. I would also balk at labelling the 99 B-Line “Bus Rapid Transit” as he does. Vancouver’s greatest strength was the concentration of vision allowed by true regional planning. The Livable Region Strategic Plan, adopted in 1996 as a framework for making regional land use and transportation decisions, is now the game plan for the entire region. Well that might have been true once, I must say that I disagree. The expansion of Highway #1 and the rejection of even the fig leaf of a bus across the new Port Mann Bridge means that the LRSP no longer applies. And anyway, even when he was talking to Chris de Marco at Metro, there was a new Regional Growth Strategy that has replaced the LRSP. Some of the problem is that events have moved between him writing and the book appearing. Toderian and Shiffer had both gone. But the writing was already clearly on the wall, once the province decided not just to deal with the bottle neck of the Port Mann Bridge but to widen the entire freeway through the region from Boundary Road to the eastern limit of Langley Township. The Livable Region Coalition was formed to fight that, and lost. Long before he started his researches for this volume. There is, I am sad to report, no chapter on London. (UPDATE I can now report, after a tweet & email exchange with the author, that he offered one in his outline but the publisher was not interested.) It does get mentioned here and there – and no, I have not yet read the entire book. But given that London was the place that first built an underground railway – The Metropolitan Railway – and that most cities subsequently called their systems “Metro” as a result of that – does seem to me to be significant. What is missing is an appreciation of the role of the suburban railway. In London, the mainlines run north and west from the capital, and the Underground network developed in those sectors since the London and Northwestern and Great Western railways were much less interest in short haul commuters than the more profitable long distance “Inter City” market. To the south and east, suburban development also proceeded at the same pace but was driven by the Southern and Great Eastern railways, who had much less long distance traffic. The GE in fact was forced to run commuter trains by legislation. In order to build its City terminus at Liverpool Street it had to pull down a densely populated urban area called The Jago. If those people were to be relocated to the suburbs they had to be given fares they could afford. “Workmen’s fares” were legislated to allow the low paid manual workers on whom the wealth of the city depended to get to and from work every day, to their – much nicer, new homes in places like Walthamstow. The London County Council built huge housing estates – and operated frequent electric tram services to them. But the huge growth of London prior to the first world war was due to the efforts of what became the Southern Railway and its electric trains to places like Surbiton and Dulwich, Staines and Gravesend. This also seems to have been ignored in the chapter on New York. That is entitled “The Subway that Time Forgot”. But he forgets that the subway was not the only thing going on. The growth of midtown Manhattan as an employment centre that he ascribes to the subway seems to me to miss the point. Grand Central and Penn Stations were not just the terminals of the transcontinental and the Chattanooga choo-choo. They were the hubs of extensive long distance commuter networks – and still are, come to that. That made it possible for people to commute to their offices from Chatham New Jersey or New Rochelle New York. The huge growth of the north east megalopolis that stretches from Boston to Washington began when railways offered regular fast and frequent services that people could use for a daily commute. And the farmland and small towns quickly disappeared – and all this started and was clearly evident long before the arrival of the car and Robert Moses. Though I do think he gets that right: Moses refusal to allow railway tracks on “his” bridges was indeed perverse. The Williamsburg Bridge between Manhattan and Brooklyn carries the subway too. The lack of track on more modern bridges is indeed bizarre. Can you imagine Sidney Harbour bridge without trains? Well yes you can, since our province has been committing the same sin. The railway bridge at New Westminster used to carry cars, and then the parallel Sidney Harbour style Patullo went up and was – as usual – built without consideration for future needs. And we seem likely to repeat the same mistake. But to get back to Taras Grescoe, by concentrating on the – admittedly gripping tale – subway, he doesn’t even mention the interurbans. In our current love affair with the streetcar (the relatively slow, town centre transit) we seem to have forgotten that there was once a network of fast electric trains. The Downtown Heritage Railway uses two of the cars from that system. They went out to Steveston, but the lines also went all the way to Chilliwack – and the route through Burnaby is followed by the Expo line. Such systems criss-crossed North America. In his novel “Ragtime”, E L Doctorow has his protagonists escape attention by travelling from Chicago to New York by a series of interurbans, thus avoiding the surveillance of the main line stations by the police. Los Angeles “seventeen suburbs in search of a city” grew up because of the Big Red Cars of the Pacific Electric – and that story is told in Straphanger – and it is acknowledged as an interurban, of course. But he quickly falls back to calling them streetcars, and relies on Roger Rabbit and the great City Lines conspiracy. The point being that the interurban may have been slow when forced to share streetspace, but was very fast indeed when on its own right of way out in the country. The great benefit from the users point of view was that there was no need to transfer from the streetcar to the faster mode – in town they shared the same tracks. But because they were built just before the automobiles really got going, and were lumbered not only with legislated fares but also the costs of road maintenance, the conspiracy was really not necessary, although it was indeed real. I would like to quote more but this chapter is not one that Spacing is allowed to excerpt. So of course I am going to recommend you read not just Spacing’s excerpts, but the whole book. It is indeed highly readable and does look well beyond North America. I was really impressed with the Paris chapter where the RER and the new interurban system both get covered well. It does get to grips with how cities urban form is shaped by and depends upon its transportation system. Of course there are things we will find to argue about, but that is not a reason to avoid it. Quite the contrary. It is indeed highly stimulating. For as long as it lasts on my hard drive I am going to dipping into it and, should time permit, may well return to it. It is not an academic treatise but it does have both an index (another weakness of digital editions is the need to use the search function but from the front through each mention) and an extensive list of sources. Not that this blog is on that, of course. By the way WordPress wants to mark the fact that this post is the 1900th since I started.